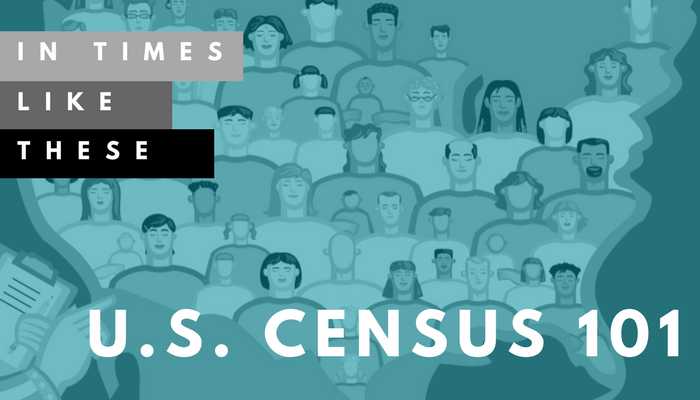 The United States Census happens every ten years. We get counted. “They” count us, and then life goes on, right? But as Ely Flores, California Director of Civic Engagement at NALEO Educational Fund tells us—numbers lead to resources. And for those populations that don’t get counted, non-profits, churches, community organizations, and the state and federal government can’t apply resources appropriately. Counting the people also becomes a political issue. When entire groups, like Latin@ children, aren’t counted, they don’t receive the resources they need and deserve. How do counties count the homeless? How do people who are undocumented respond to government-employed enumerators who come to their home asking questions? How do various ethnic categories relate to political and civic identity? 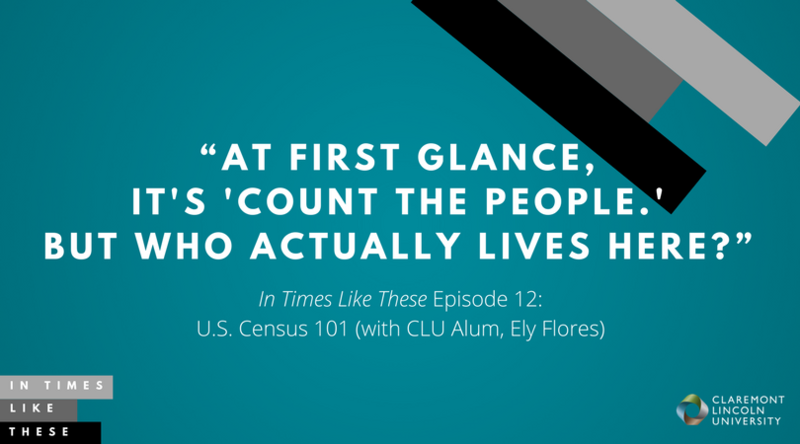 In this episode, CLU alumnus Ely Flores walks us through how the United States Census works, why it matters, and how individuals and communities can get involved to make sure every count counts. Stephanie: You’re listening to ‘In Times Like These’, a production of CLU Live at Claremont Lincoln University. 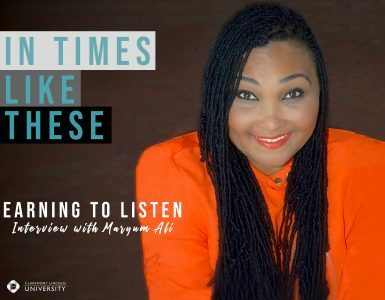 ‘In Times Like These’ explores the difficult spaces we humans navigate in culture and religion, in dialogue and doubt. The US Census happens every ten years. We get counted. They count us, and then life goes on, right? But as Ely Flores, California director of Civic Engagement at the NALEO Educational Fund tells us, numbers lead to resources. 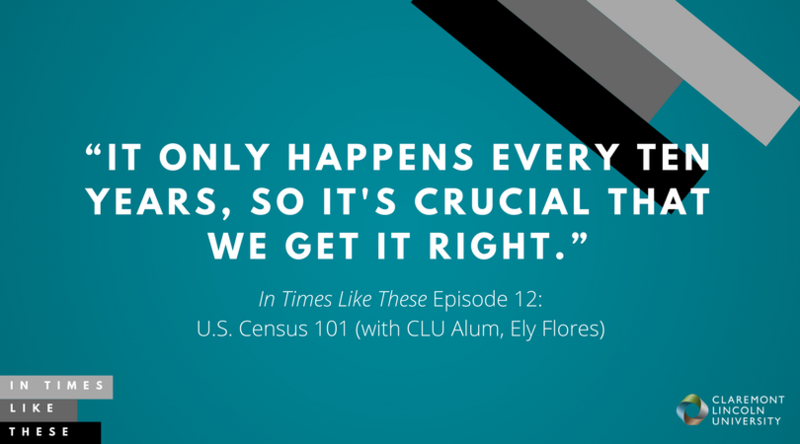 In this episode of ‘In Times Like These’, we discuss how the US Census works, why it’s so important for the count to be accurate, and how you can participate in making sure the Census works in your community. Stephanie: Ely, thank you so much for joining us today. 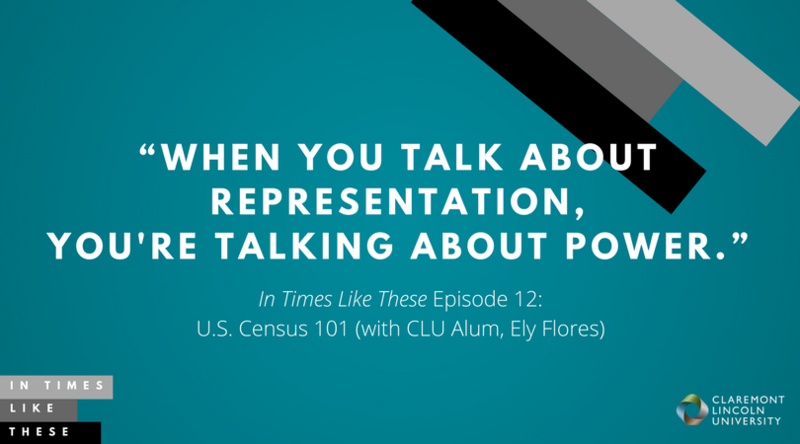 I never knew that I would be so excited to talk about the Census and what it means for civic engagement and thinking about the political climate in communities right now. So if you could introduce yourself and talk to me about the organization you’re working for and what it seeks to do. Ely: Awesome. Thank you so much for inviting me and letting me be part of this podcast. I recently became the California director of Civic Engagement for NALEO Educational Fund. NALEO Educational Fund is the nation’s leading 501(c)(3) non-profit, non-partisan organization that facilitates for Latino participation in the American political process, all the way from citizenship to public service. So what we do is a range of policy work, also training and preparing newly elected officials on various things they’re going to face during their office, and then the last thing, we have services for folks who are lawful permanent residents who want to become citizens in addition to doing voting registration, Get Out the Vote campaigns, and today we’re going to be speaking about Census, so we are heavily involved in a lot of the Census work that is happening at the national level, the state level, and in the local level. Stephanie: Wow. So when was the organization founded and what was the original impetus for NALEO? Ely: Yeah. 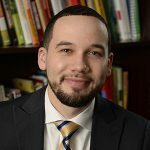 So the organization was originally founded in 1981 and I think that it originally, from the founder, who … his mission was about integrating strategies that would increase the effectiveness of Latino policymakers, mobilize the Latino community, and engage the Latino community in civic life. And at the same time, we do a huge amount of work around promoting policies that advance Latino political engagement. So I think from conception, it had this philosophy, this identity, and really the NALEO Educational Fund is an organization that I’ve learned to just admire for being able to really stay connected and true to its roots and its mission. So it’s a very mission driven organization. Stephanie: Right. So that sense of total integration of these communities into the public landscape, and then also empowering individual community leaders should be part of civic leadership. Ely: Right. Correct. And I think they do that in such a robust way. It’s an organization that really maximizes its resources, its reach, its partnerships, and also just the people within NALEO Educational Fund, it really maximizes the talent that it has and the experience that it has. So yeah, I’m just honored to now be a part of this organization. Stephanie: Okay. So why the Census? The Census happens to us, it happens for us, it happens with it. Why is it something that is so key for this constituency and for all constituencies? Ely: Yeah. Great question. I think the … the Census happens every ten years. It seems like a lot of folks forget it. Within that time frame, it’s like, “Oh it’s been another ten years. We’ve got to talk about Census again.” But Census is one of those things that really drives everything from financial resources, representation at the Federal level of communities. When you’re talking about the Census, you’re talking about, also, the real representation of the population of people, right? And who is actually in this country because then I think we can actually talk about the diversity that does exist in the country, and exists across communities that you might not think there’s certain ethic groups there. But I think for us, in particular California, the Census really matters because it really talks about, or it drives federally funded programs, or how these are funded in California, for instance. We’re talking about federal aide, highway programs, we’re talking about education, English language learners under the elementary and secondary education act. And then we’re talking about programs like the state’s children’s health insurance program, CHIP, which provides free healthcare to children. Ely: This is all really connected to having an accurate Census count. And this is why the Census is such an important topic that sometimes we forget about during the middle period of the decade, but we are, NALEO is a leading organization in this space, continuously talking about the Census, even when it’s a few years until the Census, and that’s why we’re so heavily involved in the Census already, now. So that we’re a part of this work and the conversations and already telling people to be aware that it’s coming. Stephanie: Okay. So at first glance, it seems simple, straightforward. Count the people. But you raised a good question, which was, who is actually here? Who lives here? So it seems to me that that could easily become a political issue, so how does the work of the Census balance wanting to be accurate, and how does that get politicized? Stephanie: These are good questions, right? Ely: It’s a good question. You’re absolutely right. It becomes political because when we talk about representation, you’re also talking about power. Power in the way of potential voting power. Power in the way of certain states being about to advocate for more resources for their state, some states that have less population may have less resources because the population doesn’t require as much as other states, but it also, in terms of even just having a voice on the federal level at the Senate and the House, it directly drives how many seats states are going to have there. And so I think that it becomes political in that way, and so even now, when the Census is coming up in 2020, it definitely has been a political conversation around funding to do the actual Census work, in addition to what should be on the Census as questions, and what should not. Ely: And all these things are definitely rooted in politics and they’re also rooted in who people feel should be represented or not. There’s a lot of things involved in the Census, the leading up to it, and the after doing it part. Stephanie: So tell us, remind us, how it happens. Who is counted? How are they counted? How do they know that I live in Upland, California with a husband and a son, and he’s twelve and I’m 40. What are they interested in knowing? And who does it? Ely: Sure. All the Census efforts are typically led by the US Census Bureau. And the Census Bureau is able to have reach across the country because of funding and the cut in funding this time around, the Census Bureau has had to dramatically lower their field office numbers, has dramatically lowered some of their testing around messaging, some of their piloting of certain things, so that’s already something that is going to be an issue once the actual Census work starts happening. The Census Bureau really leads the charge, but there’s definitely huge involvement around community organizations, community members, local elected officials, because it’s a vested process for them as well because they reside in those states that can be affected if there isn’t an accurate count of their state, and there isn’t an accurate count of the population. Ely: So the US Census Bureau, many times, partners with a lot of organizations, a lot of states, local governments, organizations, communities. Across the board, it’s typically a united effort to be able to drive this report. So when it comes to actual data collection, first you have cities, counties, and states participate in a process where you try to have an accurate understanding of the addresses that exist in their jurisdiction. So cities would be involved in that process, counties would be involved in that process, and states. You try to get as much accuracy when it comes to addresses, and when it comes to location. And then, you move into the process of actually having the Census coordinate numerators and folks that are going to get out into the community to actually either do the Census count, walk around and do a more accurate understanding of the landscape of certain communities, and [inaudible 00:10:38] get the word out and get folks to sound up and actually do the Census. There’s a bunch of that work that has to happen when the Census kicks off. Ely: And yeah, I think in terms of the information, the information that the Census is asking about is demographic information. It asks you different things about ethnicity, the number of people that live in a household, all these sort of detailed information the household, which really is able to give the federal government a good understanding of their population, both from age to ethnicity to number of people. So yeah, it’s all of that information included in the Census, and all of the … like I said, all of that information is going to drive how the federal government then moves and proceeds to allocation of funding and potentially adding or taking away seats at the federal level in the political process. All of that is involved. It’s really a big process, it’s a big system, and we’ve got to make sure that it’s accurate. Stephanie: Are the questions on ethnicity straightforward? Do most people know or have a strong feeling regarding what they should choose? That’s a privilege question, right? Because I’m white, so that’s a question that I haven’t personally had to examine. Ely: No it actually gets … I think it does get a bit … I don’t know if complicated is the word, but it definitely affects the way that folks look at their ethnicity or answer their ethnicity. I think specifically for folks who identify as Latino or Hispanic, it does allow you to sort of … it does allow you to state that you’re Latino or Hispanic on the ethnicity part, but once it gets down to the race, there’s really no option to select beyond that, so most people either select ‘white’ or they try to put ‘other’, try to put another classification, but sometimes, my understanding is that a lot of those folks that put ‘other’, there’s no actual racial category for that. They most times just get sort of sent over to the ‘white’ category, when it comes down to putting it into the system. So yeah, it’s definitely, I think, an issue around the ethnicity and the race question. 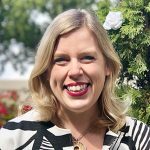 Stephanie: And if I were a person interested in getting public policy around Head Start programs, or trying to prevent incarceration of entire groups of people, I would be really interested to know race and ethnicity and household size and access to food and access to healthcare. So that would be a critical question for me to plan, when I’m planning schools and school policy, and food and food policy. Stephanie: You want accuracy there, right? Ely: Yeah. They try to be as accurate as possible, to know where we should be driving resources, yeah, and how we should be planning because it happens every ten years, so it’s crucial that you get it right because for the next ten years, we’re going to be going to back to this data. So this data, it’s going to drive a lot of the way the funding is sent out. When I had my own non-profit organization and we had to work with the Department of Labor through the Youth Pell Grant. The Youth Pell Grant is heavily [inaudible 00:14:19] on Census tracks, and being able to say, “This is where we need that funding.” Or, “This is where we need this funding based on this Census track.” So we’re saying that this Census information is as accurate as possible, which then allows a lot of our organizations on the grassroots level to apply to some of those federal grants, that allows us to then serve these communities and these areas. Stephanie: Right. Okay. So what are the challenges that an organization like NALEO or like a non-profit or a religious organization, all of these grassroots coalitions that are participating in informing communities, informing individuals, what’s the challenge that you’re trying to meet? Are you telling people they should participate? Are you telling them how it happens? Is it dangerous for some communities to participate? Ely: I mean, I think the overall message is that we want, or we hope that we get as many people counted as possible. A lot of people counted if possible. For non-profits and community groups, it is very crucial for these groups to be a huge part of this process because a lot of our communities have trust with a lot of local organizations and groups, so it’s their voice in this Census where it’s going to be crucial to the success and the accuracy of this count. With that being said, I think we are in different political times right now, where yo hear a lot of different things, whether it be in the media from politicians, from local organizations. Ely: Especially when it comes to conversations around immigration issues, DACA issues, all these different issues. So I think that that could be an issue for folks who, for years, have been in their … thinking for themselves, “Hey I should talk less to the government. I should be more careful about the information that I give, that I provide.” I think when we’re thinking about folks who are undocumented, there’s obviously a fear of what can happen to them because of their status, so I think the big challenge is going to be if we can mobilize our communities and be able to encourage our communities to ensure that they count and ensure that they will be safe if they participate in this Census. I think it’s a challenge, but I think that’s a challenge that we have to face, and that we have to do our best to talk to our communities on the importance on Census, and not just for themselves, but for the next generation that’s going to be here for the next ten years. That could be their children, that could be their family members. Ely: A lot of these resources that are in the communities now, we need to count in order for these resources to not just remain, but to possibly increase, and for us to be able to bring more resources to our state and our communities. So it’s a challenge that we have in front of us, but we’re definitely moving forward and we’re working hard to build the collaborations, the partnerships, the coalitions, in order to work together to make that happen. Stephanie: Being human is a messy endeavor. We are made to be in relationships, and yet our fear of diversity keeps us apart. My new book explores this paralyzing paradox. ‘Interfaith Grit: How Uncertainty Will Save Us’ is available now on Amazon and on our blog. It’s for all of us, ordinary readers seeking race to learn how to engage with difference. Interfaith grit is possible, and it can save us. Stephanie: So you basically attended a couple of high level trainings about what we’re talking about, so tell me, what did you take away? What surprised you? What did you find or learn about this process or these policies that you think is important for engaged community members to keep in mind? Ely: Sure. I have … I’ve been part of different round tables at the local level, state level, and also at some national round tables. I think one of the things that I take away is that there’s still a lot of enthusiasm amongst the organizations, amongst the community groups. I’ve noticed that a lot of the organizations are up for the challenge. They are not backing down at the idea of making sure the Census counts. I also understand that we have a lot of folks at the US Census Bureau who also are very encouraged and are really working hard … even with the limited amount of resources that the Census Bureau has, they’re definitely working hard to try to do as much as possible with those resources and be able to support the community organizations that are going to help do this work. Ely: So I’m encouraged that, on the federal level, there is still an eagerness to work with local organizations, local groups on the local level with the US Census Bureau here in Los Angeles. I’m definitely encouraged from my meetings with them because they definitely know the importance of the Census count. They value partnership, they value participation and input and feedback. So I think for me, it’s encouraging in these times where you hear different types of rhetoric. I’m encouraged at these meetings to hear a lot more rhetoric around collaboration, working together, the importance of this work, the Census work, so I’m just happy to be a part of those circles because it’s refreshing, it’s inspiring for me, in my role, to hear that we’re not alone in this work. Stephanie: That is inspiring. I know. I feel like a lot of people our age and younger feel, sometimes, disillusioned with the idea of government. Like, “They’re not here to help us. They’re not here to help us thrive and they don’t want the best for our community.” So almost a sense of doubt that something as massive and as important as a Census would have a positive impact in our lives. That is encouraging. Ely: Yeah. 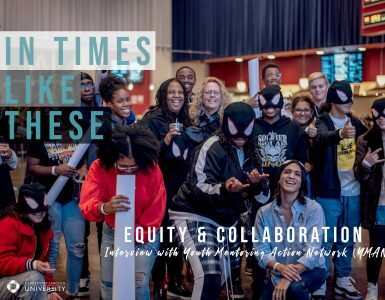 And I think it is, and honestly, I would love if this type of collaboration really gets publicized more because I think it would encourage a lot more communities to see that there is collaboration across the board, across political lines. There’s folks that … I was just in Washington DC, speaking to different senators and congressmen, and you can tell across the aisle, that the Census is an important topic, it is an important issue, and I think folks across the board know what it means to be fully represented, especially for folks who have constituencies back home. They know how important the Census is, so I think if we heard that more, I think it would encourage community members more, it would encourage young people, it would show a light of collaboration that we are not seeing so much right now in the media, but it definitely is happening on the grassroots, on the community level. I think collaborations are happening. Stephanie: So remind me your title. Your title is something with the phrase ‘civic engagement’, is that right? That’s your title? Ely: Yeah. It’s California director of Civic Engagement. Stephanie: So tell me an example of something you’ve experienced that exemplifies positive civic engagement? Ely: Sure. I think one of the main programs that we have that I think really … it shows proof of our work is our citizenship work. So through our citizenship and naturalization work, we are able to support lawful permanent residents to become US citizens. So we help folks through the process, getting ready. There’s some cases where folks have a little bit of complex issues, so we’re able to provide the support, the legal support, for them, through partners, like Loyola Marymount University, and so in this work it’s very evident to me because you can see the need, and you can see what our services do. But I think for me, where I see the full scope of the impact is when they become citizens, and you see that these folks really want to register to vote, they want to vote, they want to make sure that they’re counted in the voting process, they’re excited to vote. Ely: I think for me, seeing that really tells me that this work is impactful, it’s important that we do it. My own grandmother became a citizen a few years ago. She’s voted in every single election ever since. I have to go over there and read her the ballots, initiatives every single election. I go there, I take my time, I read it to her, and so I think for me, seeing that is, for me, the impact of this work, but then it also is telling me that this is the way we are moving our communities, our Latino communities to participate in the political process. And this is a way that it’s happening, and I think it will continue to happen because this work that we’re doing is growing stronger, in my opinion, by the year. Stephanie: Yeah. I think since doing this podcast series and talking to leaders like you, every single person has said that they have hope. They have hope for what they’re doing. They have hope for our government. They have hope for their community, they have hope for this nation, so that’s been a great learning piece for this audience to remember. That yes, we have work to do, and yes, we’re leaving to a place where we’re more enriched by our differences than we are hurt by differences. Ely: Most definitely. For me, it’s … I’m the type of person that really is driven by impact, by my passion, by my love, and I would really also point it back to Claremont Lincoln University because my program was social impact, and so I feel like this program was perfectly designed for someone like me because it’s really hard for me to sit somewhere, whether it be a seminar, a training, a workshop, or my job, and not look at the impact side, and not have that very clear understanding of, this is the impact we’re having, and this is the impact we will have a year from now, five years, ten years from now. Ely: So I think for me, this work has been fully aligned with who I am as a person, as a leader, and what I hope to do in the future. I think, for me, being a part of the political process, who knows, I may one day want to run for office. Who knows? But now I know that this is the full scope of being involved in the political process. Stephanie: I was going to ask that. I was going to say, so imagine … fast forward 70 years from now. You are an esteemed leader, you maybe are retired, you’ve written memoirs. When you look back, how will you know? What will have changed in Los Angeles? What will have changed in the United States? How will we know that the work that we’re doing has had the impact that you hope it has? Ely: For me, and I always look at impact or what I hope to have an impact in my life, not as to say like I hope we have more of this than that, but I’ve always used my work as the work of balance, of the work of providing balance in our communities, in our institutions, in policy, where we can have balanced policy. I understand … I’ve grown up and I’ve worked before at organizations that, we challenge incarceration, we challenge mass incarceration of color, of young people, and so I remember when I was doing that work, a lot of folks would tell me, “We just need to shut down the prison.” But I always thought to myself, “Okay, so then what’s the alternative? What do we do on the flip side?” So for me, I began to say, “Look. If these prisons aren’t going to be shut down, we need to push, then, for real rehabilitation within these prisons. We need to push for reentry programs. We need to push for prevention programs on the grassroots level.” We need to do these things because we need to balance this equation. Ely: For me, it felt like massive incarceration was a complete imbalance. So I hope that when I’m 70 or however old, I can look back and really think about that and say, “You know what? I worked hard to bring about this balance.” Or, “I’ve worked hard to provide a balance in the community. In our state. In our country.” And then at the same time, say, “Look. This balance,” depending on sometimes who is elected, or depending on what the feeling is around that time, culturally speaking, it could become imbalanced, so I feel like this work never stops. So I just hope that I can continue to work for that balance. That balance of justice, of equality, and hopefully when I’m 70, if I have inspired other folks to be part of that work, a whole other generation of people to be part of that work, then I think at that point, I think my work was worthwhile. Stephanie: That’s such a great frame. I really appreciate the frame of like, I’m not going to fix this problem and move on, because you’re right, it’s an issue of power and privilege, as cultural movements change, as the Census of who we are changes, as food becomes scarce but water becomes more plentiful, as all these things are influx, things are never going to disappear. Hunger, poverty, education, certain things, so yes, how can we put things more equitably? How can we balance things? That’s a really helpful frame for me. Thank you. Stephanie: Okay, so we’re going to return to the Census. It’s going to happen in two years. What should I be doing? Should I be looking in my mailbox? 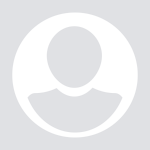 Should I be checking out your website? Ely: Yeah, so when it comes to what do you do now? How do you get involved? What should you be looking for in terms of the Census? I think first, I mean, if you want information on the Census, I would encourage everyone to visit our website at NALEO.org/Census. I think you’ll get a great understanding of the Census work that we’re hard … we’re talking about the Census already. Then, at our site, you actually can join our campaign called Hagase Contar, in Spanish, and in English, it’s make sure you count, or get counted. So our campaign, what we hope to do is bring together organizations, individuals, people who want to be involved in getting Census work, so you can actually join this campaign through our site on the Census page, and that’s one way that we can stay connected and begin to share with you toolkits that we’ll be working on, ways that you can actually do your own work in your community. So I would definitely encourage that. Ely: And then lastly, part of our site, we also have more information about our work, which is … if you go to Make Census 2020 Count, Resources, one of the things I would definitely point to, and I think this is a point that we are really pushing for this Census around is based on the 2010 Census, there was approximately 400,000 young Latino children, ages zero to four, who were left uncounted. So one of the things that we’re pushing for this year is that we want to make sure that as many communities are aware that happened, are aware of that, and second, what do we do about it? So across the country, we’re convening Census round tables, briefings, policy briefings for folks to understand those issues, so what we call them is the invisible ones, how Latino children are left out of our nation’s Census count. And then yeah, that way we can talk about what do we do about these issues? So there’s really … we talk about this like education. Educating and alerting stakeholders. Alerting stakeholders about this issue. Engagement. Improve targeted outreach, those areas with a large number of uncounted children. Ely: Partnerships. Develop more partnerships with vested stakeholders, such as civic engagement organizations and early childhood education organizations. And then lastly, research. Examining who the uncounted children are and what neighborhoods they live in. So we’re testing language used by the Census instructions in low income communities, and with low income Latino parents, it’s important for us to be able to gauge clarity and be able to understand what messages are going to be effective, when we’re talking about making sure that their children count. So yeah, those are all things that people can definitely get connected to. Like I said, I think the first step would be to definitely visit our site, NALEO.org/Census, and I would encourage you to join our campaign, and definitely stay connected with the work that we’re doing. Stephanie: That’s so great. So this is an invitation, this is not just, “Here’s [inaudible 00:32:40] Census.” This is an invitation to go a little bit further and to link up our communities to your communities so that we can all be enriched by full participation and representation. Ely: Yeah. Correct. And like I said, I’m just very honored and privileged to have been part of … and still part of the CLU family and community, and so definitely I would say reach out to me if there’s any detailed questions, any things that you would like to know, definitely reach out to me as well. You can connect with me through CLU, and yeah. I’m here to also be supportive in helping to encourage folks and connect folks to many of the organizations at a local level, that maybe they can conduct some of this work with. Stephanie: Thank you so much. Thank you so much for making this topic accessible and immediate and urgent and an invitation to participate. I really, really appreciate it. Ely: Awesome. No, thank you so much. It was a privilege to speak to you and I encourage everyone to not just count themselves, but really encourage their communities to count as well. 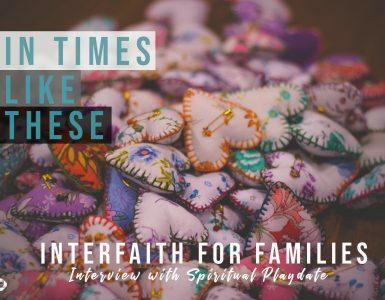 Stephanie: Thanks for listening to ‘In Times Like These’, where we explore issues in politics and faith, and learn from one another how to navigate difference for maximum flourishing. ‘In Times Like These’ is a part of CLU Live at Claremont Lincoln University. For more, subscribe, share, and visit us at ClaremontLincoln.edu. Census data helps decision making in every area of civic life: planning for schools, for prisons, for higher education, for staffing for government employees and first responders, and for non-profit and community organizations. Think of all the places you access resources from the federal, state, and local governments, and from non-profit agencies. Those resources are directly tied to the Census count—so getting the numbers wrong can be catastrophic. While the Census itself is a non-partisan issue, and supported by political leaders on both side of the aisle, ideas about immigration, poverty, homelessness, and “deserving” come into play when we talk about allocation of resources. How does the Census work? How do enumerators go to every single residence? What about unofficial residences? What about the homeless, those in prison, those in hospitals, and those who are living and working here unofficially? The challenge to get an accurate count is immense. And it will take a lot of community leadership and collaboration to make everyone visible. NALEO invites participation and engagement to make sure collaboration across all sectors continues. You can Ely on Twitter @elyflores. You can also find NALEO on Twitter @NALEO, on Facebook here, and on LinkedIn here. 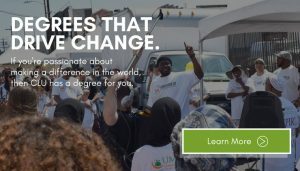 Claremont Lincoln University offers socially conscious master’s degree programs in organizational development, public administration, human resources management, healthcare administration, educational leadership and administration, and social justice.